This classic board game is simple to learn yet difficult to master. Download the shareware version of the classic board game Reversi. Some of the main features include the following: Internet/Network support, Automated update checking and download, Save/Load games with symbolic names, Hint and progress indicators, Take back moves, Adjustable algorithm search depths, Multiple fast algorithms with different playing styles, 3D rendered animation, Human or PC opponent, Optional instant replay at the end of a game, Visually preview moves before committing, Advanced multi-threaded architecture, Resizable/Configurable playing board, Official Game Notation displayed at the end of a game, Visual analysis with slider bar, Context sensitive help (F1 key), Game board remembers size, position and other appearance parameters, Sound feedback, Roll up feature by right clicking on the title bar, Dialog Animation effect. 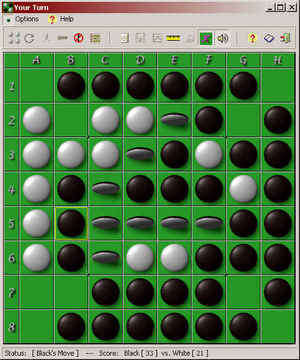 Deep Green Reversi 5.0.0 is a shareware program and can be used as a demo to try the software until the free trial period has ended. A full version of the program is available after the trial period ends. For security reasons, you should also check out the Deep Green Reversi download at LO4D.com which includes virus and malware tests. Additional screenshots of this application download may be available, too.